There is the Libby's canned Pumpkin, Costco Pumpkin pie, Marie Calendar's Pumpkin pie, and here is my KABOCHA-KAKI Pie (Japanese Pumpkin FUYU Persimmon Pie). My brother is a great backyard farmer. He got his green-thumbs like our mother. Thanks to them, we get our fresh tomatoes, bell peppers, oranges, lemons, various peaches, including Japanese Pumpkins - KABOCHA seasonally. 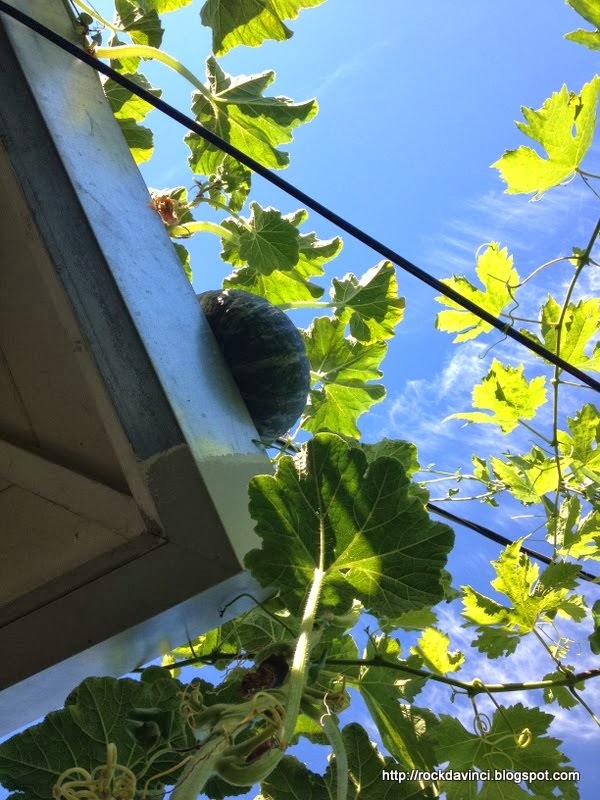 And one of the KABOCHA even wanted to have a higher position in the garden to force others to be its subject, and raised itself high off the ground to grow on the roof. And I gobbled it up, anyways. I love Japanese KABOCHA. Whenever there is Tempura vegetables, I always looked for the tempura "IMO" - Japanese sweet potato. But it's expensive, and all I can find at the all-you-can-eat buffet is the tempura potato or carrot. Then, they started to serve tempura KABOCHA. It's delicious. There are many experienced foodies who know how to prepare KABOCHA, please listen to them, rather than from me. I found out how to prepare them by experimenting on my own, then, later with some tips from my sister. Oh, well, I should have asked first. But it's funner to figure things out a bit yourself, first. 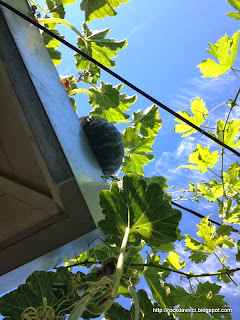 First, KABOCHA is a squash. I figured its density is not much different than the A-Corn Squash, so I cut it open, clean out the center. Wash out the seeds and save them for the next crop. **Don't forget to keep saving some good heirloom seed for future planting. I could wrap it up in aluminum foil with some butter, roast them, and serve. Easy, right? But cutting the KABOCHA open is a challenging ordeal. In its raw form, KABOCHA is as tough and hard armored as armadillo, likely. Although I have never cut an Armadillo before (a good thing.) You need a good heavy sharp knife and Japanese utility knife to slice it open. Then, slice it up. Put in Heavy Duty Zip Lock bag and freeze them. For lunch, take out, microwave it covered with a tablespoon of water or boil them in a pot with your favorite broth or water. It cooks and become tender quickly. Then, I got thinking after my sore hands, to roast them whole in my covered turkey roasting pan. Great idea! I washed it clean and place them in the roasting pan with some water till fork tender. The bigger KABOCHA is meatier. It was a good idea. Then, I found out that my friend does that too. You scoop out the center -- seeds and fibre. Scoop out the KABOCHA into a bowl. It's time to make it into pie. Tip: Prepare pie crust first 30 minutes before preparing the pumpkin filler. Because the pie shells require refrigeration - rest - before being rolled out. Mix all together in a mixer. Set aside. Roll out the pie shells. PIE CRUSTS: *** Prepare pie crusts 30 minutes before the filler. One recipe for two flaky pie crust. Roll one out and transfer to a pie pan. Prick gently the bottom of the pie shell with a fork. Tip: Brush the bottom pie crust with beaten egg white. This will keep the pie crust crisp. Tip: Use Forks to mash butter into butter to keep butter in its form. Roll the flaky buttery dough between the plastic for ease of rolling and to keep from sticking onto the rolling pin and to avoid extra flouring to prevent tough dough. Use your favorite cutter to cut out patterns to decorate the top of the pie. If you don't have one, just do a free hand with knife. Be sure incorporate and use the extra trimmings left as well. Brush with egg wash. Bake till crusts are golden brown and knife inserted comes out 'not wet'.